Gamma 2 Robotics’ RAMSEE borrows the name of pharaohs, which is fitting since it works the graveyard shift. 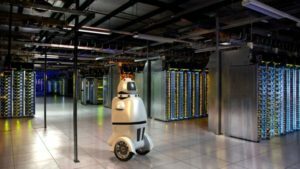 The security bot is an autonomous patrolman, rolling around empty halls and hard-to-surveil places, its LIDAR eyes and infrared cameras scanning the environment around it at all times. It is a robot built for empty spaces, alerting its human overseers to any harmful intrusion of life. The main features of RAMSEE are the infrared vision, laser radar navigation, 360 degree cameras, heat sensing, and toxic gas detection, but the marquee item is that having a robot do patrols is cheaper than having humans do them. Graveyard shift – a period between midnight and 8 a.m.
1.What do you think of a security guard’s job? 3. In a 2013 Oxford University study on job automation, researchers said that security guards stood an 85% chance of being replaced by machines. In the future, will robot security guards be the norm?